Welcome to my latest course report, thanks go to my staff and volunteers for their hard work and efforts over these cold months, I hope our Christmas lunch helped me to say thank you to you all for your help as its much appreciated. Our Christmas lunch has now been running for about 5 years now, and it’s a good afternoon all round. Since the last report we been working through our winter tidy up tasks and improvements when the weather conditions have been favourable to do so. The course has been drying over the period since the last newsletter, this is due to the soil drying out well during the summer and our continued aeration work being carried out on all our playing surfaces help-ing to reduce surface tension and dead grass materials building up to quickly. All surfaces have been deep aerated with a solid tine down to between 4 and 8 inches, our greens, tees and rough have also been slit spiked to help water move through the turf and soil profiles. Following this we made a start to our winter work programme out with our normal winter aeration work etc., this work has been sketchy due to not having any extra winter budget spend allocated this winter (last year we had £10K). This has meant we have done lots of smaller jobs mixed in with some larger projects when materials and staff levels have al-lowed, we still intend draining our problem 7th green and hopefully our 3rd green before the start of the season. • Investigation work at 14th Green done by Coal Board, then front of green drained. • Chainsaw work carried out over the course to remove diseased and dangerous problem trees. 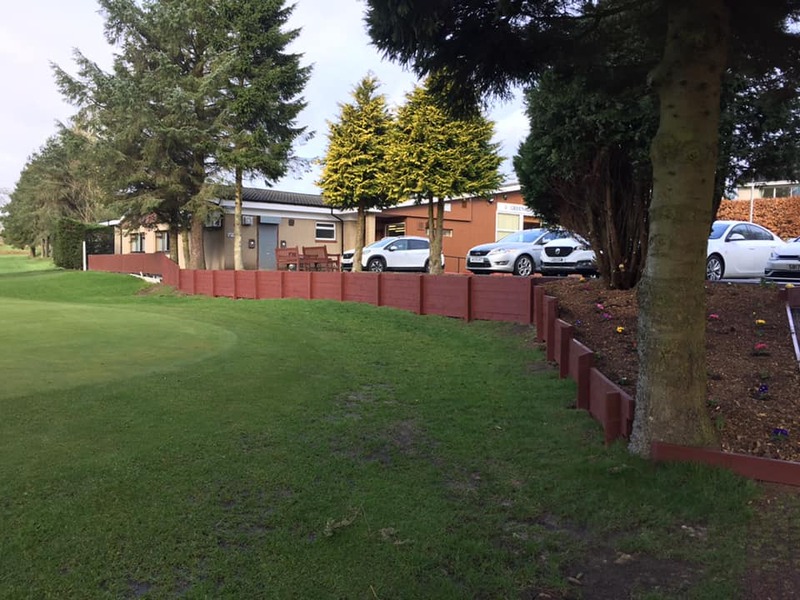 • New 17th fence and garden developed in conjunction with West Lothian Council. • New 18th O.B line/garden developed to the left of green, this area has further developments to come with landscaping work to be carried out on the back approach. • 9th Ditch across the fairway being brought into play as a hazard, complete with wood edge and new base. • 4th Road edges have had their 1st infill of soil, ready for 2nd fill and over-seed to al-low mowing. • New sand installed into bunkers prior to edging work being carried out. • Water blockage repaired at old sheds and blockage at 12th burn exposed to allow water to reduce its levels. • Problem tree stumps and bushes removed to top of putting green to improve area for mowing and tidiness. 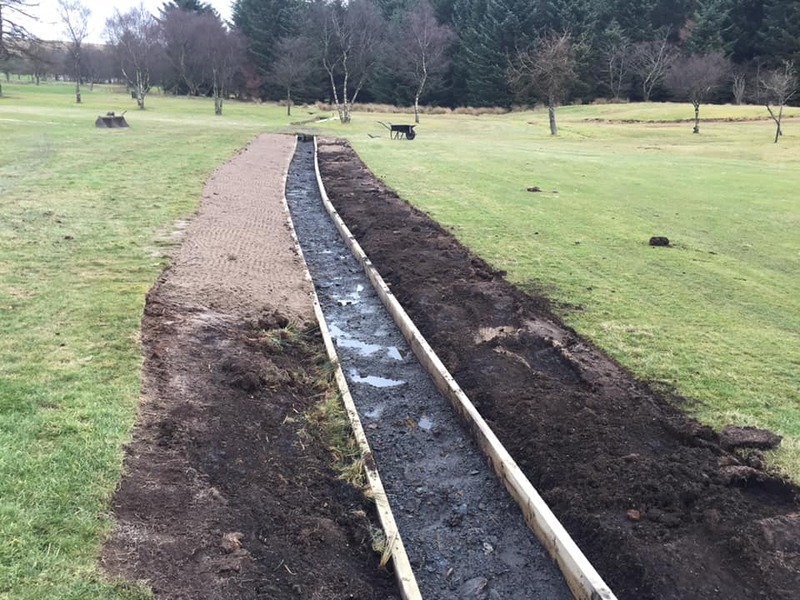 • 16th Medal tee extended, and safety risk removed with ditch filled in. • 8th, 9th and 10th Drain lines improvements. • 9th Ditch renovation complete, base upgraded for next season. • 9th Main ditch cleared out at fence line. • Tree stumps excavated out, to be soiled over etc. • Worn areas over course to be turfed over bunker edges etc. • 4th Road edged to be topped up and seeded. • Bunkers to be edged and sand relocated where needed. • General aeration work to surfaces. • Red ash to be spread over paths. • Continue to control moles over the course. Just some of our extensive works over the winter. The greens are currently performing well and have had some recovery following our disease issues from late last year, we do still have issues though with pest damage within our greens soil, ranging from Leather-jackets to Parasitic Nematodes. Once the temperatures rise in the spring again, we will tackle these issues and over-seed our greens as normal following our renovation works, hopefully prior to the season, this is as always dependent on the weather. We continue to treat any disease issues with non-chemical applications as this is far healthier in the short and long term for staff, golfers, the plant/soil and the environment, not to mention the phenomenal amount of money that is saved and used more efficiently and allocated to other are-as of the golf course budgets. The golf club continues to support Continued Professional Development of the greens staff, this is great as our industry is evolving all the time and we can all learn along the way. You will notice we know have bird boxes going up over the course, this is to help encourage friendlier Starling birds to the course, these birds will help reduce insects over the course and cause very little damage compared to Magpies and Crows. 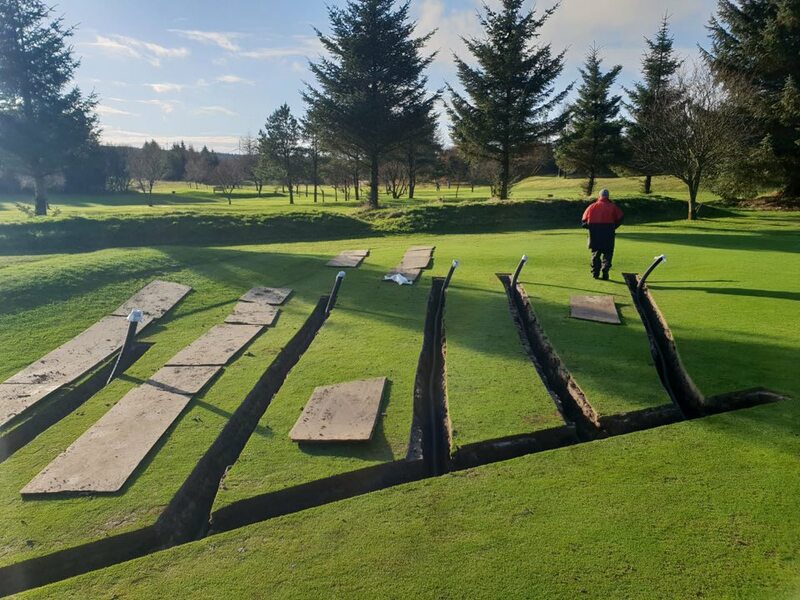 As indicated in our last course report/newsletter, following the results we have received back from our most recent soil tests, we are now looking to adjust our renovations works to be carried out this coming season. We will now be carrying out more and less disruptive scarifying work to the greens and we can accommodate a smaller core to be removed from the greens in the spring/summer this year, this along with the continued seaweed and com-post tea applications will at this point control the buildup of dead material that we need to keep removing or recycling to produce good healthy playing surfaces. We hope all golfers and visitors have a good season ahead, and we look forward to catching up with you when on the golf course. Any feedback or ideas on how you feel we can improve our facility for you all, then please contact us and we can hopefully help to make this year another great golfing year.